After nine months of confusion, chaos, and cascading tweets, Donald Trump’s White House has finally made one thing crystal clear: the U.S. is staying in Afghanistan to fight and — so they insist — win. “The killers need to know they have nowhere to hide, that no place is beyond the reach of American might,” said the president in August, trumpeting his virtual declaration of war on the Taliban. Overturning Barack Obama’s planned (and stalled) drawdown in Afghanistan, Secretary of Defense James Mattis announced that the Pentagon would send 4,000 more soldiers to fight there, bringing American troop strength to nearly 15,000. After 16 years of continuous war in that country, the obvious question is: Does this new campaign have any realistic chance of success, no less victory? To answer that, another question must be asked: How has the Taliban managed to expand in recent years despite intensive U.S. operations and a massive air campaign, as well as the endless and endlessly expensive training of Afghan security forces? After all, the Afghan War is not only the longest in U.S. history, but also one of the largest, peaking at 101,000 American troops in country during President Obama’s surge of 2010-2011. As with any movement, there are multiple reasons for the Taliban’s success, including the failure of the government in Kabul — a cesspit of corruption — to deliver anything like rural prosperity, the country’s martial tradition of fighting foreign occupiers, and Pakistan’s sub-rosa support, as well as the wide-open sanctuaries in its tribal backlands along the Afghan border. But there is one other factor, more fundamental than all the rest: the opium poppy. The U.N.’s crop survey for 2016, compiled by hundreds of Afghan enumerators who regularly walked through the poppy fields — and corroborated by sophisticated satellite imagery — adds yet more somber strokes to this picture. That year, at 5,600 tons the opium harvest was again up substantially (by 43%). In the same period, opium eradication efforts fell by 91% to a mere 355 hectares of the crop destroyed, or less than 2% of all illegal poppy fields in the country. In what was then seen as a clever political gambit, the U.N. argued, according to Sopko’s report, that “it was necessary to destroy 25 percent of the standing poppy crop each year in order to deter future planting,” in the process justifying the employment of thousands of Afghan peasants to pull up poppy plants. Defending that crop suppression program, Antonio Maria Costa, the Soviet-trained Italian economist who then headed UNODC, declared, according to Sopko, “that there was no relationship between poppy cultivation and poverty.” From his high modernist headquarters in Vienna, Costa pledged “to reduce poppy cultivation by 70 percent in five years and eliminate the crop altogether in ten years” — a claim that soon proved laughable. Near the start of Washington’s Afghan adventure in 2002, the U.S. military, the CIA, and the country’s American-supported president, Hamid Karzai, had little interest in or next to no knowledge of the drug problem. Other actors with far less power — the U.S. embassy in Kabul, the U.S. Drug Enforcement Agency, the World Bank, and the European Commission, among others — all made periodic forays into antinarcotics work. Funds for such operations ebbed and flowed, while new initiatives were regularly launched without significant analysis of or thought about past policies. Meanwhile, the whole question of opium eradication has, according to Mashal, gotten surprisingly “little attention in the Trump administration’s new strategy for the Afghan war.” It seems that U.S. counter-narcotics officials have come to accept a new reality “with a sense of helplessness” — that the country now supplies 85% of the world’s heroin and there’s no end to this in sight. Alfred W. McCoy, a TomDispatch regular, is the Harrington professor of history at the University of Wisconsin-Madison. 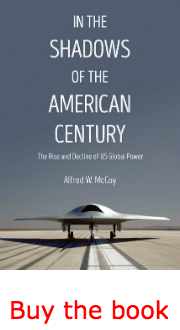 He is the author of the now-classic book The Politics of Heroin: CIA Complicity in the Global Drug Trade, which probed the conjuncture of illicit narcotics and covert operations over 50 years, and the recently published In the Shadows of the American Century: The Rise and Decline of U.S. Global Power (Dispatch Books).